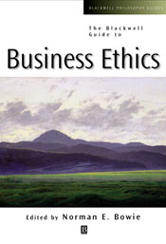 The Blackwell Guide to Business Ethics, written by international experts in the field, acquaints the reader with theoretical and pedagogical issues, ethical issues in the practice of business and exciting new directions in the field. - Provides the foundation for understanding the impact of technology and globalization on the business world. - Includes discussion of pressing current issues such as the ethics behind healthcare and the genetic revolution.